Description: Wonderful open floor plan, close to park and pool with mtn views await you! Gourmet kitchen w/island, loads of counter space, maple cabinets, granite, gas range, wood floors and large pantry. 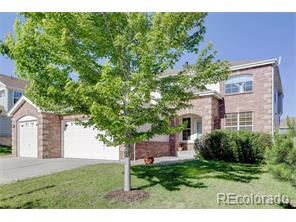 Open to family room with built-ins and two sided fireplace. Main floor study, great loft, spacious master with sitting room, fireplace and 5-piece bath! Gracious redwood deck. Dual furnaces and ac plus humidifier. New exterior paint. Alarm and radon system. All appliances included!